Building a Pacific railroad to link the American continent makes as much sense as trying "to unite neighboring planets in our solar system and make them better acquainted with each other." 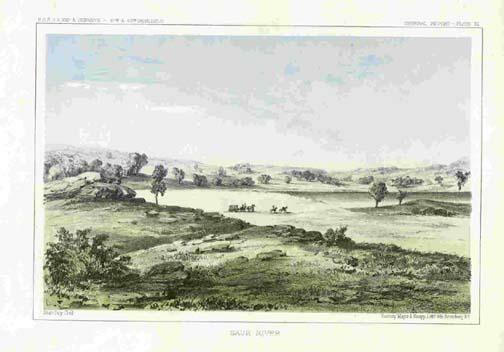 Dr. George Suckley spent most of his time investigating the prairie in fine detail as he crossed central and western Minnesota in 1853. That was unusual for a New York physician, a graduate of the College of Physicians and Surgeons. But not for Suckley. Suckley was investigating the woods, the watershed and the open prairie as a member of the Pacific Railroad Surveys expedition charged with exploring the territory between the 47th and 49th parallels from St. Paul to the Puget Sound. Soon he would resign his appointment as assistant surgeon in the U.S. Army to track the fecund terrain and natural history of the American Northwest. Five surveys were commissioned to provide guidance concerning construction of a railroad connecting the nation east to west. General Isaac Ingalls Stevens, the first governor of the Washington Territory, led Suckley's expedition from St. Paul. Once it reached the Missouri River it followed in the footsteps of Lewis and Clark half a century earlier. When the survey reached the Pacific, Stevens reported to Secretary of War Jefferson Davis, the future president of the Confederacy who had commissioned the survey, that the northern route was "eminently practicable" for a transcontinental rail route. The Minnesota Territory would be its eastern terminus. The Pacific Railroad Surveys turned out to be a sort of early version of what we know today as environmental impact studies. Indeed, Suckley's monograph on the Natural History of Washington Territory (1859), co-authored by James G. Cooper, is often referenced in ongoing disputes concerning endangered and threatened wildlife in the Pacific Northwest, most recently the salmon population. "Not since Napoleon had taken his company of savants into Egypt," wrote a historian of the West, "had the world seen such an assemblage of scientists and technicians marshalled under one banner... The immense quantity of data collected by these government scientists constituted a plateau from which it was possible at last to view the intricacies of western geography." Perhaps their greatest accomplishment was to provide the plant and animal specimens that jump-started the Smithsonian Institution's natural history collections. Suckley's reports on the mammals, water birds, and fishes his party collected were published in the Supplementary Report of Explorations for a Route for a Pacific Railroad (1859), volume 12 of Pacific Railroad Surveys issued by General Stevens. By a Smithsonian account, "One of the Army's young contract surgeons with an interest in natural history had passed the Department's entrance exams before accompanying a survey party exploring possible railroad routes in the Northwest. George Suckley cared for the sick and injured among the men and also served as a naturalist, under [the Smithsonian's Spencer] Baird's guidance. 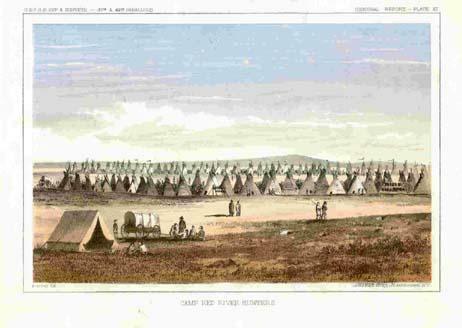 The Smithsonian provided the necessary supplies and required that Suckley collect and study zoological and botanical specimens, familiarize himself with the Indians and their history, and make notes on rivers and their currents and falls. He initially had much time for this work because the men in the party were generally quite healthy, but his efforts to send his specimens safely back to Washington did not always meet with success. On at least one occasion, Baird was confronted by a container in which 'unfortunately nearly all the fish were spoiled.'" Survey drawings of what they saw in their search for a Pacific railroad route were later converted to color lithographs. 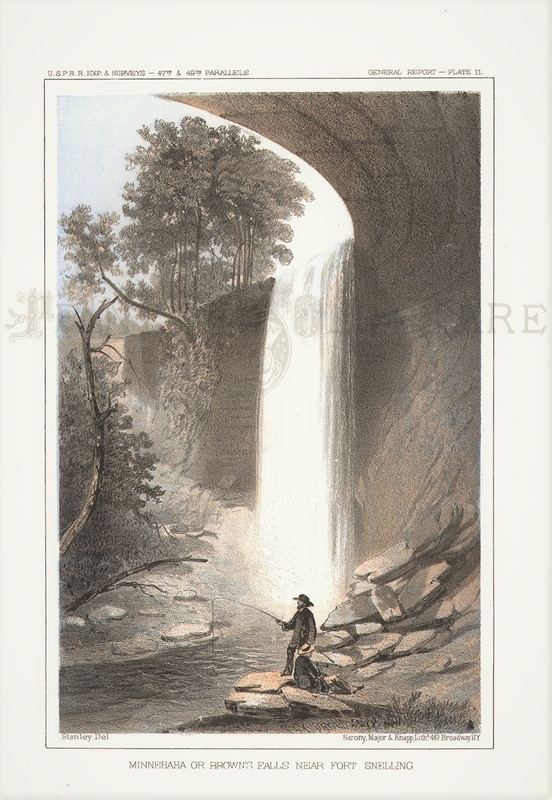 They include depictions of Minnehaha Falls, Lightning Lake, Sauk River, and "Camp Red River Hunters". George Suckley died in New York in July 1869. He lived just long enough to read about Leland Stanford, the California governor and president of the Central Pacific Railroad, swinging the silver hammer onto the spike at Promontory, Utah, marking the completion of the first transcontinental railroad in the United States. But Suckley's passion was for the natural world, not the world of human creation. The dream of a railroad crossing the continent was the dream of others. His dream was to immerse himself in the study of natural landscapes, in observation, discovery, and description of uncharted territory and living things. On July 1,1862, Abraham Lincoln signed into law the Pacific Railroad Act. The very next day Lincoln signed the Morrill Act, thereby joining in time the concept of exchanging land for progress: progress in transportation, commerce and communications; and progress in education -- in particular on equipping students with the knowledge and skills for work in agricultural and the technological economy. The transcontinental railroad baron Leland Stanford founded Stanford University in 1885 with an endowment of $30 million following the death of his son Leland Jr. from typhoid, saying "The children of California shall be our children." Today, no institution of higher education is more closely associated with current revolution in communications technology than is Stanford, at the heart of Silicon Valley. But it was the railroad more than the land-grant university that altered the American political, economic, and physical landscape in the 19th century. Then as now, revolutions in education take longer to take hold than revolutions in technology and communications. The railroad "changed this society by stitching it together ever more tightly, by amplifying dramatically the number of commercial, social and communications exchanges that could take place over broad distances," says David M. Kennedy, the Donald J. McLachlan Professor of American History at Stanford and a member of the American Academy of Arts and Sciences. "It disrupted forever traditional ways of life, brought more people into the market economy. Among other things, it helped to extinguish, or significantly reduce at least, the great native American civilizations that had led largely nomadic lives on the great plains. So, more than any other single factor... the railroad changed the face of American society." David Haward Bain describes in consummate detail how the job was done in this book Empire Express: Building the First Transcontinental Railroad [Viking, 1999], the great engineering project linking the coasts was all about speculation, manipulation, exploitation and expropriation and nothing about the purity of field biology that animated George Suckley or, for that matter, the ideals of educational opportunity represented by the Morrill Act of 1862. "His inquiries are somewhat more to the point. He wishes to know the length of your road. He says, let me see your map and profile, that I may judge its alignment and grades. How many cubic yards of the various kinds of excavation and embankment have you, and upon what sections? Have you any tunnels and what are their circumstances? How much masonry, and where are your stone? How many bridges, river crossings, culverts, and what kind of foundations? How about timber and fuel? Where is the estimate of the cost of your road, and let me see its details? What will be its effect upon travel and trade? What its business and revenue? All this I require to know, in order to judge if my investment is likely to prove a profitable one." There is a proper place for the dreamers in any grand plan. 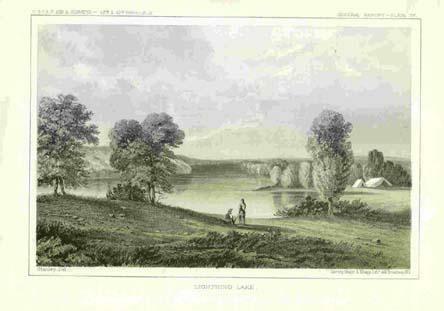 Indeed, Asa Whitney, cousin of cotton-gin inventor Eli Whitney, first proposed a railroad from Lake Michigan through Wisconsin and Minnesota westward to the Pacific in the 1840s, and Judah himself was an unrelenting advocate for such a road. But the "barons" would be necessary to have their dreams realized. Yet once they had finished their tireless and sometimes tawdry work, people like Leland Stanford turned to creating and endowing educational institutions to provide the necessary skills to the society they had helped to transform. In a sense, "the so-called robber barons both created the society that needed an educated work force and then, in another stage of their lives, helped create the institutions that would sustain an educated work force that would move the society forward," according to Stanford's David Kennedy. "The needs of the late 19th century were mostly for semi-skilled industrial labor but increasingly as the new century dawned and as this university, Stanford University, opened, a need for managerial skills of all kinds, that required more and more educational inputs if people were going to acquire those kinds of talents and use them beneficially." And so it is today, with practically all high-technology geographic regions, dubbed "clusters" by Harvard management strategist Michael Porter, having at their heart the university with its charge of equipping students with the brainpower they need to succeed in an increasingly competitive world. Bain's book was the subject of a prescient review by New York Times technology columnist Edward Rothstein, "Looking at the Transcontinental Railroad as the Internet of 1869." The instant Leland Stanford struck the iron spike with the silver maul at Promontory, Utah, he forged a telegraphic communications link that would be "heard" around the country. Bain writes: "In every city equipped with fire-alarm telegraphs, the alarm would sound. Moreover, in San Francisco and New York, the telegraph was also attached to cannons on the shores of both oceans--at the signal they would fire, as it were, warning shots out over the Pacific and Atlantic to the rest of the world: the Empire Express was won." The same native braggadocio, of course, is evident today and the past six years with the unprecedented rise of new communications media, especially the World Wide Web, and America's leadership position in advancing the new technology for economic gain. Writing just before the bursting of the dot.com bubble and "get rich quick" schemes reminiscent of 19th century railroad speculation, Rothstein observed that today's changes "don't require hammers and spikes or immigrant work crews' chiseling through rock or forges turning out thousands of miles of rail. Today's networks are extensions of that telegraphic signal, not of the tracks beneath it. They involve telecommunications companies and television cable companies, wireless telephones and computer networks, electronic transfers of cash and stock and commodities--the exploding world of the Internet." Rothstein should have included education and research in his description, for these activities are being transformed as well, albeit at a more measured pace. One initiative to boost that pace is the Learning Federation, a consortium of U.S. academic institutions, businesses and government agencies that is proposing to coordinate research in a wide range of sciences with the goal of accelerating progress in e-learning. Learning Federation advocates compare today's opportunities to expand education through e-learning "to the creation of the land-grant schools in 1862, which helped to lift American agriculture and industry to international pre-eminence," according to the British weekly The Economist. The "Millennium Partnership," a new initiative of the National Association of State Universities and Land-Grant Colleges (NASULGC), would draw on resources from federal and state governments and the private sector "to ensure that higher education institutions have the technological infrastructure to integrate technology into the traditional curriculum, provide more flexible educational opportunities for part-time, non-residential students, and develop new partnerships with K-12, business and local communities." NASULGC President and former University of Minnesota President C. Peter Magrath, in a community letter written in January, observes that the "current reality is that many states recognize the economic impact of research performed at their universities. Many state leaders can cite great success stories about the benefits such research has brought to their areas. California, Massachusetts, and North Carolina are just a few examples." A number of states "have made major new discretionary investments in research," Magrath writes. "Michigan is developing a billion dollar bio-technology-research and life-sciences corridor in southern Michigan with tobacco settlement money. Georgia is making a significant investment in its Georgia Research Alliance of six public and private research universities in collaboration with business, to strengthen both capital and human infrastructure in a selected number of vital scientific arenas. Most recently, California's governor has pledged $75 million annually over four years for three collaborative research centers that will pair scientists at University of California campuses with scientists in industry. So far more than 200 different companies already have pledged support for the research centers." Minnesota is also taking stock. In its report issued last December, University of Minnesota President Mark Yudof's Working Group on the Minnesota Economy proposed establishing a public-private partnership called the North Star Research Coalition. Minnesota Senate Bill SF0501, introduced in early February by Richard Cohen of St. Paul, calls for the University's Board of Regents "to establish a partnership with private industry to leverage the university's research capabilities into economic development results through the creation of a nonprofit tax-exempt corporation." Michael Porter and the Council on Competitiveness, a consortium of university, industry, and government leaders, are calling for a national effort to bolster the globally competitve strength of high-technology regions. In a report released in January, "U.S. Competitiveness 2001: Strengths, Vulnerabilities and Long-Term Priorities," Porter and the Council's Debra van Opstal write that "Regional public-private networks improve the physical and policy environment for cluster innovation." Today, the nation and its colleges and universities are poised at yet another frontier, that of developing new landscapes, both virtual and global. The residence of the Swiss ambassador to the U.S. is located on Cathedral Avenue in Washington, DC, just up the block from the embassy. It is set back from street on a slight rise amid the rolling greenery of the embassy grounds. You get there by passing through wrought-iron gates and proceeding up a drive to a cul-de-sac. The occasion was a reception being hosted by Alfred Defago, the Swiss ambassador, to dedicate a "cluster alliance" between Minnesota and the Zurich Region of Switzerland. I was on the list of invitees because I had a hand in forging the alliance through my work at the University of Minnesota. It was a perfect late September evening for such an event. About 70 people attended, enough for sustained animated conversation lasting several hours, with a brief program interspersed. The program dedicated the first ever region-to-region web portal link in the combined medical and biotechnology field: The MBBNet - Zurich MedNet Link. The link joins academic and innovative strength at the heart of two continents, North America and Europe. It is designed to serve as the foundation for cooperation in education, research and development, community building and trade. Though the event was to dedicate a linking of geographic regions and networks, the ambassador's residence required some quick improvisation to supply modest visuals. A small-screen television and VCR were recruited for viewing an endorsement of the link by Nobel laureate Richard Ernst of the Federal Institute of Technology in Zurich (ETH). In introducing Ernst, Ambassador Defago reminded everyone that Switzerland has many more than its share of Nobel Prize winners, given its size and population (some 7 million people). Zurich alone has had 20 of them, including Albert Einstein. And it probably has another waiting in the wings in Ingo Potrykus, inventor of "golden rice," described as a "latter-day Johnny Appleseed" whose work has the potential to save millions of children in the developing world who suffer from vitamin A deficiency. As the evening wore on, I found myself standing on the veranda with my attention occupied by historic Washington gleaming in the distance. I thought about how much had changed in such a short time. A modest web project I had initiated without pretensions in early 1995 was beginning to assert itself internationally, perhaps becoming a bit pretentious in the process yet getting respectful notice from a highly respected region of the world. That was mighty satisfying. In the months since, I've caught myself back on that veranda thinking about the romance of 19th century railroads, about communication and connections and colleges and capitalists and people like George Suckley, trained in medicine, an eminently practical pursuit, but devoted like an academic researcher to exploration and discovery, and Leland Stanford of the "getting the job done" school of thought. I've caught myself thinking about ideas and geography and how they are joined: How the great city-states of history -- Athens, Florence, London, Singapore, the San Francisco Bay Area -- made their mark by reaching out. How Richard Ernst grew up in Winterthur, a railroad city next to Zurich that made the locomotives that powered the trains over the Alps and how, in another time, the city initiated a project to partner with Minnesota in biomedical technology, with Ernst's blessing. How, based on his 1849 map, Asa Whitney's Pacific Railroad would have passed a few miles north of my hometown in south central Minnesota. How Whitney's proposed railroad route westward from Prairie du Chien, Wisconsin was the same as the overland route my great grandparents took after the Civil War in pursuit of land made available to settlers by the Homestead Act of 1862. How a railroad to the American West wields power over the imagination far exceeding its weight in iron. Partial map of a "route for a Pacific railroad, compiled to accompany the report of the Hon. Jefferson Davis, sec. of war. G.K. Warren, lt. top. engrs. 1855." The route followed the U.S. - Canadian border to the Washington Territory and Pacific ocean. Map collections, Library of Congress. The MBBNet - Zurich MedNet transatlantic link, joining Minnesota with the Greater Zurich Region of Switzerland. Dedicated in September 2000 in Washington, DC. Reported in the Congressional Record.